A co-winner of this year's Nobel Peace Prize called Monday for a global fight against genocide and sexual violence, pledging to be a voice for victims around the world. 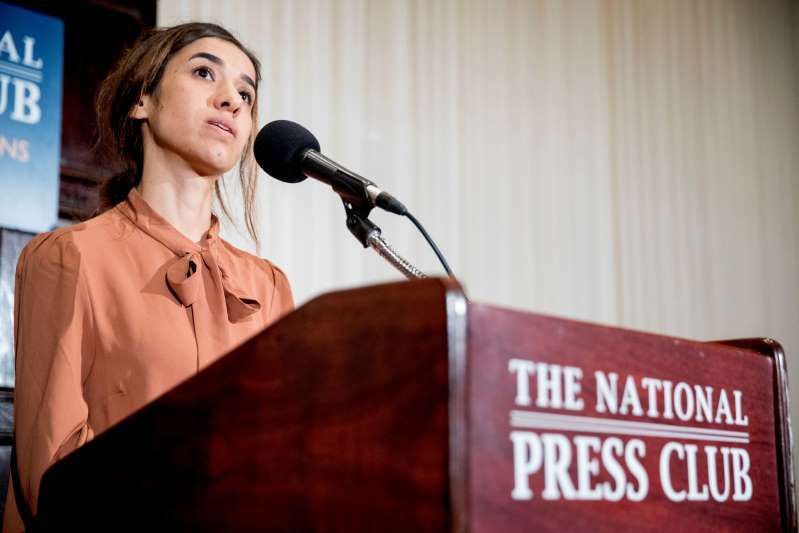 "We must work together to put an end to genocide, hold accountable those who commit these crimes and achieve justice for the victims," Murad told a packed room at the National Press Club. ce their roots to a number of small villages in a remote part of northern Iraq. Murad was awarded the peace price Friday along with Congo's Denis Mukwege, a gynecologist who treats women victims of sexual violence. "So far we have not seen justice happen for the Yazidis, especially the victims of sexual slavery," she said, adding that said she would like to see Islamic State fighters stand trial for their crimes. In 2016, Murad was named the United Nation's first Goodwill Ambassador for the Dignity of Survivors of Human Trafficking. Murad outlined plans to focus more on rebuilding Yezidi communities in Iraq going forward. "But without peace, even if we rebuild, life is not possible," she added. "My hope is that all women who speak about their experience of sexual violence are heard and accepted," she said.